Trained German Shepherds have been used as protection dogs for both police officers and private families for more than 100 years. These dogs are known for being both obedient and hard-working. The breed thrives on human contact, and excels when given direction, top-rated training, a well-balanced diet and good exercise. If you are looking for a protection dog for personal or professional purposes, you will find that the German Shepherd working dog is one of the best breed choices. 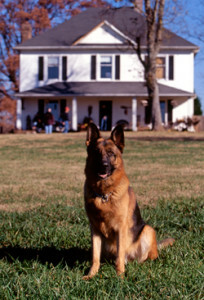 When considering protection dogs, you should receive a dog that has already been conditioned to various commands. Comprehensive obedience training, positive reinforcement and motivation-based training, should be combined with the selection process of elite breeds to ensure that you receive a trained champion, not just a protection dog. Working dog tournaments are designed to keep civilian protection dogs active and also are designed as a competitive sport for owners & trainers. The tournaments allow German Shepherds to show off a variety of their protection dog skills, including obedience, agility, searching and tracking. Simanovich protection dogs have covered and excelled in all these areas within working dog tournaments: tracking, obedience, & protection. Any dog can demonstrate average skills in these areas with formal training, but not every dog excels at these skills. A Wayne Simanovich protection dog has received elite world-class training, and demonstrates incredible stability in distracting situations. If you are looking for a German Shepherd as an executive protection dog, a guard dog, or a family protection dog, you will want to choose a dog that offers both protection, and huggable security around those who are closest to you. Anyone can create a website, become a breeder, and ship dogs across state lines. When choosing among people who train and sell protection dogs from the wide variety of protection dogs for sale, be sure to do your homework. Ask about training. Ask about the background of the trainers, and get a history from them. If possible, visit the training grounds. A dedicated, top-rated dog trainer will be happy to answer these questions for you.